Hugh Victor McKay established the Sunshine Harvester Works in 1889, which produced the Sunshine Harvester for grain harvesting, revolutionising the wheat industry in Australia. McKay had developed the first stripper harvester in the 1880s which became the prime machine for grain harvesting in Australia. McKay moved his works from Ballarat to Braybrook Junction in 1906 and the locality was renamed Sunshine in the following year. The facility expanded to become one of the largest manufacturing industries in Australia, producing a wide range of agricultural implements. Within three years of commencing operations at Sunshine Harvester Works, McKay was employing 1,000 workers. McKay purchased land and had a suburb designed along garden city principles. As an amenity for his workers in 1909, McKay established a garden across the railway line to the west of the factory, first known as the Sunshine Gardens, and later as the McKay Memorial Gardens. McKay was inspired by recent overseas industrial village precedents and by garden city planning ideals. The workers estate at Sunshine was a planned suburb with similarities to British garden suburbs such as Bourneville and Port Sunlight. Part of the concept was the provision of community infrastructure and McKay had provided finance for the railway station, church, hospital, electric lighting and windbreaks. McKay received the highest public acclaim for the provision of the Gardens. The H V McKay Memorial Gardens are triangular in plan, bounded by the railway line, Anderson Road and Chaplin Reserve. The main area of the Garden was designed in the Gardenesque style with sweeping lawns, curving paths, garden beds for floral displays and specimen trees through the lawn. The railway line boundary features a long garden bed with dense border planting. At the northern entrance off Anderson Road, there is an iron gate with concrete posts as well as a bluestone gatepost. 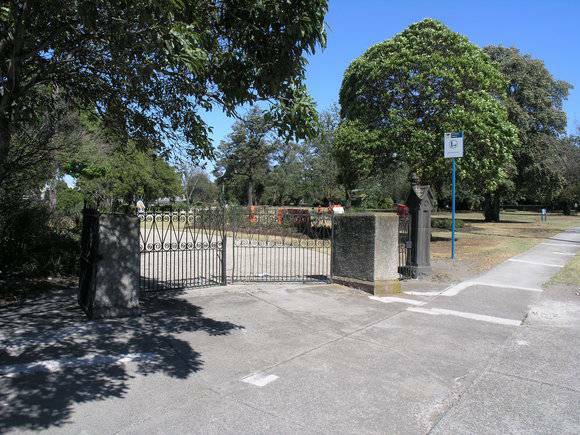 The gates were the work of Charlie Pippett (circa 1920) who was a blacksmith at H V McKay Sunshine Harvester Works and the bluestone gatepost is thought to be the work of Nathaniel McKay (father of H V McKay) who made the fence and posts for the Scots Church in Collins Street. Within the Garden a number of facilities were established including a tennis court, bowling green, bandstand, conservatory and Curator's House. The bowling green was extended in the 1960s over the existing tennis courts with a negative impact on the coherence of the gardens. The bandstand was removed possibly in the 1960s and the conservatory was burnt down and demolished in the 1990s. A timber Presbyterian Church had been established on Anderson Road in 1907. Its land was enclosed by the gardens and McKay donated adjacent land for the new church which was built in 1926-8. The garden is directly linked to the entrance to the former Sunshine Harvester Works site by a railway footbridge. The footbridge was an amenity used almost solely by workers moving to and from work, giving access to the gardens for their recreation. The Works were largely demolished in the 1990s and the clock tower and iron gates now mark the factory entrance. H V McKay requested that Victorian Railways build a foot crossing over the lines at Devonshire Road in 1907. The footbridge was built in two spans over the four main lines (Ballarat and Bendigo lines) as well as two siding lines. The main beams of the original timber bridge of 1911 were soon replaced with steel joists. An extra span was added to cross the roadway (Harvester Road) in 1930, and this span was widened again with roadworks in 1997. The decking, handrails and risers of the older sections are in timber. Safety fences protecting the main lines are of pickets and stairs are protected by galvanised wire mesh. The H V McKay Memorial Gardens and Railway footbridge is of historical , social and aesthetic (landscape) significance to the State of Victoria. The H V McKay Memorial Gardens and Railway Footbridge are of historical significance as an integral part of an industrial complex of national importance in the history of Australian manufacturing. This importance is now heightened by the demolition of most of the factory buildings. The gardens and railway footbridge remain immediately adjacent to the factory site, and both elements retain fabric from the period in which the factory and adjacent suburb were established. The H V McKay Memorial Gardens and the Railway Footbridge are historically significant to the State of Victoria for their association with H V McKay who was an inventor and pioneer industrialist of national importance. McKay was personally involved with the establishment of the gardens. The H V McKay Memorial Gardens are of historical significance as an early, rare and intact privately funded garden, attached to an industrial site, catering primarily for the recreation needs of workers, their families and local residents. Due to lack of public gardens in Sunshine and western Melbourne generally, the Gardens achieved a high profile. This was enhanced by their reputation for horticultural excellence formerly exemplified by annual floral displays. There are few other examples in Victoria, or Australia, of public gardens given and maintained by an industrial firm. More recent sites of a similar type include gardens for workers at the Footscray Ammunition Factory, Gordon Street, Footscray (mid-late 1920s) and Fletcher Jones Gardens, Warrnambool (1940s ? 1950s). The H V McKay Memorial Gardens and Railway Footbridge are of historical significance as they form a key component of a wider complex envisaged by McKay, which also included the factory, offices and a housing estate for the workers. The McKay Gardens and associated elements in Sunshine are a rare and early example of the application of garden city planning principles. The role of the Gardens in the scheme can still be appreciated as the fabric of the Gardens is relatively intact and the spatial relationship of the gardens to the factory site and housing estate is still readily understood. The H V McKay Memorial Gardens and the Railway Footbridge are of social significance as a tangible link to the era when the factory was in operation. There are still strong memories in the community of the Gardens and footbridge in their roles of access routes to and from the factory and as a recreational area for the workers. The main pedestrian route for workers from the housing areas to the west of the railway line to the Sunshine Harvester Works was through the Gardens and across the railway footbridge. With the factory largely demolished in 1992 and the high level of housing and retail redevelopment in the area, the McKay Memorial Gardens are now a particularly important reminder of the dominance of the industrial activity in the life of the local community. The footbridge is particularly demonstrative in this regard, as it is the only access of any kind across the railway line for several hundred metres and this route leads immediately to the front gates of the factory. The H V McKay Memorial Gardens is of aesthetic (landscape) significance for its relationship to its surroundings. The Gardens appear as an 'oasis' in the heart of a densely developed industrial and residential area, which is enhanced by strong boundary planting.